Shaun Wright-Phillips seems to like rich men and rich men seem to like Shaun Wright-Phillips. Yesterday, the under-achieving, fleet-footed stepson of Arsenal legend Ian Wright squeezed his way out of the overcrowded Manchester City dressing room yesterday and followed the money yet again, this time to join Premier League wealthy new-boys Queens Park Rangers. With Malaysian businessman Tony Fernandes at the helm of the Loftus Road club, Sky Sports’ Jim White and his army of reporting minions were kept busy with the comings and goings at QPR on transfer deadline day, with former City wideman SWP one of the highest profile names to move to the west London club. SWP’s penchant for following the big money is nothing new. Indeed, he was seduced by the big bucks of both Roman Abramovich (Chelsea) in 2005 and then the Abu Dhabi United Group (Manchester City) in 2008. But while it’s pretty obvious why the impish winger has always chosen the company of rich men, just what do these millionaires and billionaires see in SWP? Is it his boyish looks? Or his “chilled” nature? Or maybe they see him as a “fixer-upper” project, someone who they can help reach their potential and finally become that consistent top-class footballer that everyone expected he would? Whatever they see in him, it’s surely about time the England man finally settled down and made the most of his undoubted ability. Doesn’t matter how you spell his name, he’s always been an awful football player. Shauny WRIGHT WRIGHT WRIGHT! Shauny WRIGHT WRIGHT WRIGHT! 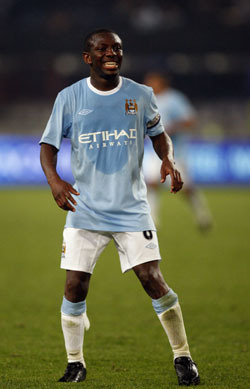 Best of luck SWP, we’ll all miss you at MCFC. I know he’ll return again before its all said and done. dc is right! SWP left city to join chelsea and regardless of wages, we needed the transfer fee money, but he re-joined city before they were taken over, wanting to play more regularly & because he loves/is love by city! Hope he excels at QPR! !